Welcome to any new readers! Check out my links in the sidebar to the right (must reads), or my tabs above (the salad story, yoga + fitness, recipes, and my recommendations). I updated my recipes page. All recipes are waist-friendly, most are vegetarian or vegan, many are raw or macrobiotic – there are tons of options. I will be updating the layout of the page soon (I hope) to make it more navigable and sortable, but for now I am so happy that ALL my recipes are actually listed. Go look! There are 214 recipes on there as of today. I am really happy that I have that as a history of my cooking for the last 3 years. Here is #214. Last night we ate in, and I cooked. I cooked! I have not truly cooked in ages and I have missed it so. I read Women’s Health this weekend and they had a recipe for Jap Chae (a traditional Korean recipe – it’s a noodle dish) and I wanted to make my own version of it. I used to make Jap Chae all the time, but that recipe is different from this one. It’s lower calorie, but not as filling. 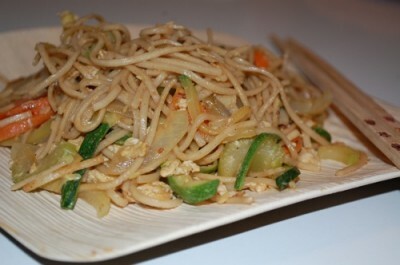 I opted to do this in typical Maggie fashion: a fusion Asian dish – soba noodles (Japanese), jap chae sauce (Korean recipe), and the addition of peanut butter (Thai) – it was awesome. Bobby agreed. This dish is even kind of macrobiotic; I approve of eggs on a macrobiotic diet. Prepare the veggies. You will add them in the order listed above. Heat the peanut oil on high heat in a wok or large pan. Add the onion, garlic, and carrots. Saute for 3 minutes. Beat the eggs with a fork. Push the veggies to one side of the pan; add the eggs and scramble them there. It is ok if everything mixes together. Add the other veggies: celery and zucchini. Saute for 3-4 more minutes. Add the noodles (drained) and the sauce; stir a few times then turn off the heat. You can continue to mix to make sure everything is distributed evenly. Serve! This jap chae recipe is perfect alone: protein, carbs, and fat. Yum yum yum. For dessert I had grapes; Bobby had a nectarine. I haven’t been into sweets lately. So strange. Enjoy, bookmark, share 🙂 Let me know if you make any of them! P.S. Did anyone notice that Chrome had an update? I like it. @Alisa: We love Vietnamese too! “non-recalled”! love it! I’ve made something similar but i didnt have peanut butter at the time so I used almond butter and it was fantastic! 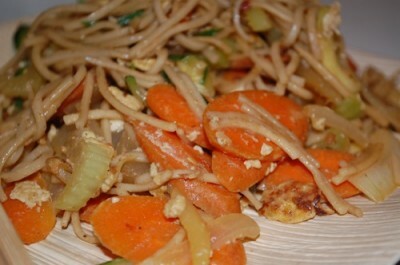 I think pad thai is my favorite noodle dish. i love how colorful it is and all the different textures. I’m a texture whore for sure. I absolutely LOVE korean food. I’m going to have to make this noodle dish to get us out of our (albeit tasty) bi-bim-bap rut. I don’t usually do noodles too often but I love cold soba noodles and pho is delicious. My goodness! This Blog is SO AWESOME!!! I’m sitting here SALIVATING looking at the dishes! Wow that looks tasty. Hi! New to your site and just wanted to say hello! That recipe looks great! I was actually going to make a similar one this week but opted out last minute because it had too many ingredietns I did not have!! I will have to save this one though! Thanks! 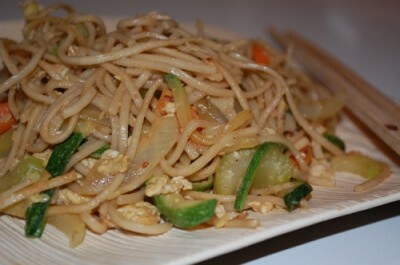 fave noodle dish would be spiralized zuke noodles + peanut sauce! @Averie: I still need to make that! !